About a year ago, I spent the day talking to the owner of a daylily farm and took lots of photos. This Daylily Hemerocallis ‘Earth Wind and Fire’) was one of my favorites. I love the shape of the petals and the flower color. Daylilies are some of my favorite perennial bulbs. You will spend a bit to get them, but an investment in daylilies pays off, big time, in your garden. The variety of petal shape and color is just amazing. Give this plant well draining soil and full sun and you will be rewarded with its beautiful blooms, perhaps more than once in a season. Here are some growing tips to get the most out of this daylily – hemerocallis. Like most daylilies, Daylily Earth Wind and Fire prefers full sun, but will tolerate partial shade. You won’t get quite the same number of blooms without the sunlight, though. The plant can take soil PH from 6.1 (slightly acidic) to 7.8 (slightly alkaline. Give the plant regular water but be careful of over-watering, since daylilies don’t like wet feet. Plant in well draining soil. 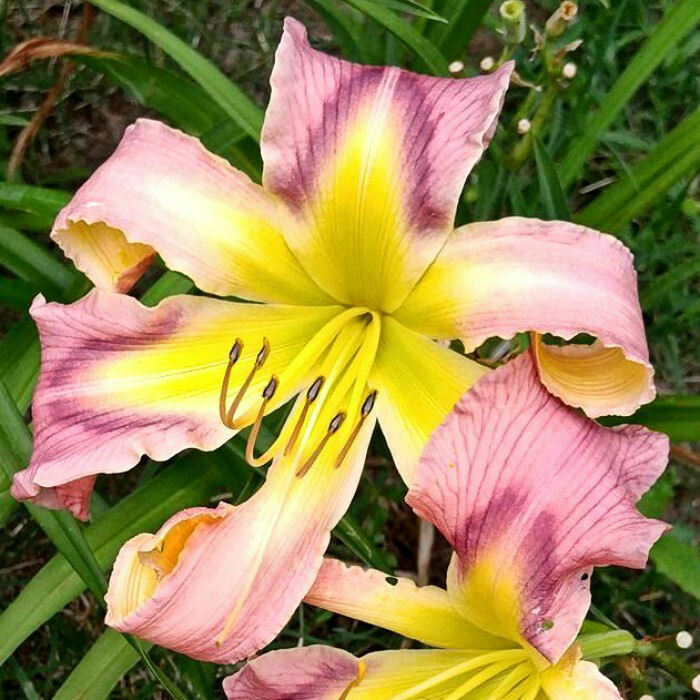 The petal style of this lovely daylily is called cascade. Cascade petals have narrow segments with a pronounced curling or cascading habit at the end. The petals flow around themselves, almost like wood shavings. Daylily Earth Wind and Fire is considered a perennial bulb. This means that after you plant it once, it will continue to grow ever year as long as you are in the correct cold hardiness zones. Give this daylily room to grow. The flowers are quite large – at least 4 inches in size and they can grow 7 inches across! The foliage is dense and the flowers grow on tall 34 inch scapes. These plants will multiply over time so give them 2-3 feet between the plants when you first plant them. The plant will re-bloom and can have a bud count of 10-15 on each plant. I find that my plants keep some of their green color with tips that go brown, so they need a clean up in spring, but I don’t have to cut them all the way to the ground. They are a bit like hellebores in this regard. The plant will over winter in zones 4a to 10b. Who doesn’t like plants for free? To propagate Daylily Earth Wind and Fire, divide the root ball when it has grown to a large size. You can also remove offsets and dig up bulbs and move them. You can save seed from daylilies but plants will not be the same as the parent. I purchased my Daylily Earth Wind and Fire from Daylilies of North Carolina. They don’t have this variety on their website, but do have many other lovely ones.